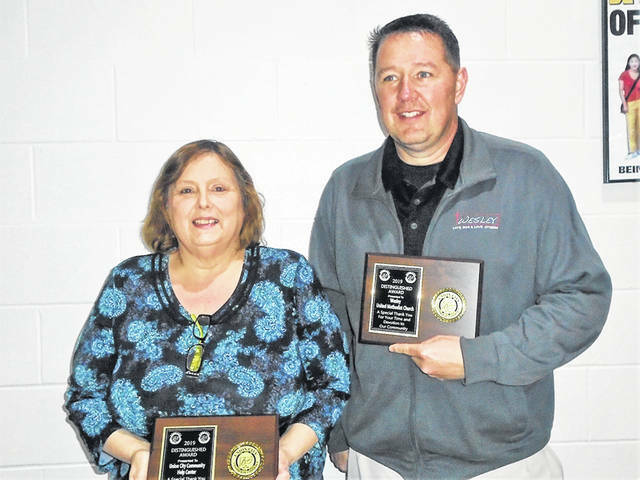 Theresa Hampshire accepted the Distinguished Service Award for Community Help Center, and Pastor Geoff Grow accepted on behalf of Wesley United Methodist Church. Merna Brenner, another winner, was unable to attend the banquet but was recognized for her work with the Preservation Society. UNION CITY – Three Distinguished Service Awards were presented at the recent Union City Chamber of Commerce Banquet. They went to Merna Brenner, who was unable to attend; Community Help Center and Wesley United Methodist Church. It was reported that Brenner was one of the first people to be on board when the Preservation Society formed to save the historic Kirshbaum Building. The Community Help Center was started when two churches, First Christian Church had a food pantry and Trinity Lutheran had a clothing bank; they decided to come together in 1986 to form a non-profit thrift store. They formed directors to start the planning stage. The store opened in October 1986 and has operated for 32.5 years now, and the board of directors oversee daily operation of the store. It was pointed out that the Community Help Center started when The Body Company, Sheller Globe and Del-Mar Cabinet Factory were going strong in the community. “When the auto industry was up and down, faced strikes and lay-offs, and when some of the businesses shut the doors some of the churches realized that there was a real need in the community,” it was reported. The Help Center receives donated items, which are sold to the public at low cost to make items more affordable to help with the ever-rising cost of living that is affecting every families bottom line. In 2008, the business received a grant to build a new store that allows it to have a positive effect in many lives throughout the local community, by helping when they are in need of food and clothing and assisting with utilities, rent or other miscellaneous services. It serves Randolph Eastern School Corporation and Mississinawa Valley, helping low-income, elderly and disabled families. Through proceeds from the thrift store, they have seen a huge increase of the families that they have been helping in the past. Those working at the Community Help Center said they are blessed with the community support from the churches, businesses, civic organizations, schools, Boy Scouts, individuals, etc. They also do Christmas baskets for the local families to help them through the holidays. Wesley United Methodist Church has been a big part of Union City for many years. Its mission statement is “to Love God and Love Others with the focus of Reaching, Transforming and Serving.” So many members of the congregation work and give selflessly without asking for recognition. After a tragic accident at a little league baseball field, the pastor was asked to become the chaplain for Union City, Indiana, First Responders. He accepted the position, with no pay, and now is a vital part of the First Responder’s Team. He not only ministers to the police, fire and EMT crews, but he also ministers to individuals and families in times of need and crisis. Wesley later teamed up with the County Corrections and Prosecutor’s office to start a Youth Guidance Program in the county. This program offers first-time underage offenders the opportunity to have a mentor, participate in community service and get connected to a faith-based community in order to get the youth back on the right track. Reaching out to the community has always been a priority for Wesley. Many years ago, what started out as feeding a Thanksgiving meal to the youth at Steps, has grown into a community-wide Thanksgiving meal held yearly at Randolph Eastern School in conjunction with the city, school and other community churches to feed more than 600 individuals each year, for the past three years. Other community programs that Wesley is involved in or established include: Cop Camp, Annual First Responder’s Night at Randolph Eastern School, Community Block Parties, Food Bank, Brianna’s Hope Chapter in Union City, Yearly Teacher Grants, Back to School Bash, Manna Ministry, United as One AAU program for Union City sports teams, Fellowship of Christian Athletes, Steps Ministry, Eagles remodel to soon become the YMCA daycare in Union City, inspiration for Girls Basketball team “Prayer Circle” and numerous mission projects across the United States and internationally. This entry was tagged Community Help Center, Preservation Society, Union City, Union City Chamber of Commerce, Wesley United Methodist Church. Bookmark the permalink.